The royal coronation procession passed along Nerudova street in uphill direction towards the last mounting over Úvoz, from where it transferred along Loretánská street towards the gates of Prague Castle. Yet during its passage through Hradčany district the procession passed many important historical buildings and we will learn about them right now. This street is linked to Nerudova street and leads towards Pohořelec. Right here a very significant path from Vltava´s fords used to lead in the past which went on as far as the north-eastern Bohemia. Originally the road was called Strahovská according to the nearby monastery. Later the name was changed to Hluboká and finally in 1870 to Úvoz. Because of the sloping terrain the vineyards and gardens were spreading along the road. 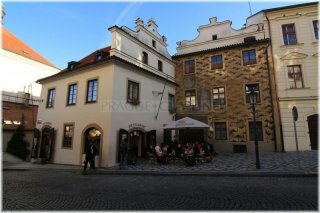 Besides the splendid houses lining the northern side of the street you will be certainly enchanted by the unique view of the Lesser Town and the historical centre of Prague at present. 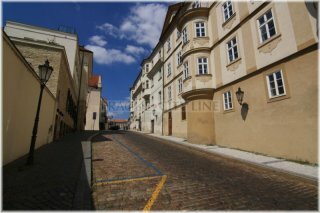 First of all, on the right side you can view the houses U Tří zlatých růží (At the Three Golden Roses), U tří sekýrek (At the Three Axes) or the house U Zrcadla (At the Mirror) with the relief of Madonna and Baby Jesus. One of the view points is also the house U Kamenného Sloupu (At the Stone Pillar) with its irreplaceable and beautifully decorated reddish facade. It is interesting that right in this house the Muzeum a knihovna Jaroslava Vrchlického (Jaroslav Vrchlický´s Museum and Library) used to reside. It neighbours on the gorgeous Renaissance house U Zlatého jablka (At the Golden Apple) and the nearby house U Zeleného hroznu (At the Green Grape). 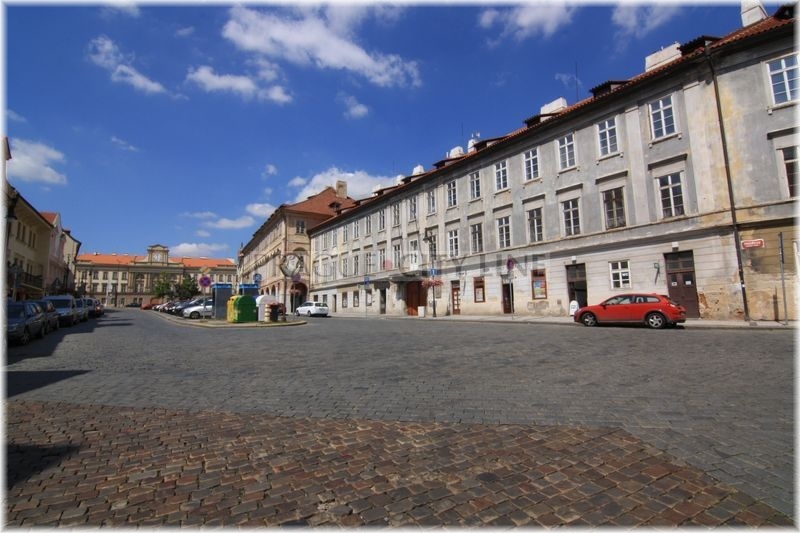 In place of the former so-called Strahovská brána (Strahov Gate) which used to serve as a gate of the second fortification of Hradčany and which was pulled down in 1899 you will find a Baroque house Na Koženém vrchu (At the Leather Hill) these days. Passers-by are also attracted by the opposite completely solitary house. It is the house called V Presu (In the Wine-Press) and it directly naighbours on Strahovská zahrada (Strahov Garden). It used to be a wine press in the past and was later rebuilt into bakery of Strahovský klášter (Strahov Monastery). Now we will continue uphill along Úvoz and our next stop will be Vrbnovský palác (Vrbna Palace). This palace is in general familiar as the so-called Chotkovský dům (Chotek House). In 1837 an institute for the blind was founded here. The institute was joined by the School of Jaroslav Ježek for the seight-disabled which operates in Chotkovský dům. The line of the splendid historical building is conluded by Trauttmansdorfský alias Trčkovský dům (Truttmannsdorf or Trček´s House). There used to be a great coaching inn in this unique four-winged palace in the past. The guests were allowed to use the large stalls for stabling their horses while they were refreshing themselves in the inn. It is interesting that remarkable painter and illustrator Mikoláš Aleš was staying here between 1885–86. Just across the palace there is a high-rising Baroque hospital of St. Elisabeth which used to serve especially the poor and ill people. Now the royal procession has reached the Prague Pohořelec. Many of us notice the interesting name of this place. The place was affected by countless fires and therefore the space between Úvoz and Loretánská street was called Pohořelec. It was not only burnt down by the Hussite troops and remained completely deserted for decades but Pohořelec was also affected by the fire of the Lesser Town in 1541. Yet unfortunate was also the year 1742 when Pohořelec turned into ashes after the raid of the French troops. As a result of the fire all houses in the square were rebuilt in Baroque style. Currently this part is lined by beautiful houses with gables, facades and you can also view the well-preserved house signs according to which most houses were called. 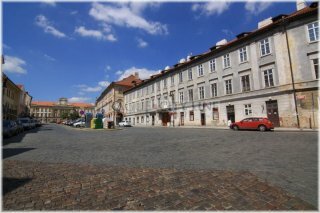 Before we learn more about the houses and palaces surrounding Pohořelec we need to draw your attention to the dominant statue in the very centre of the square. It is a Baroque group of statues of St. John of Nepomuk originating from 1752. 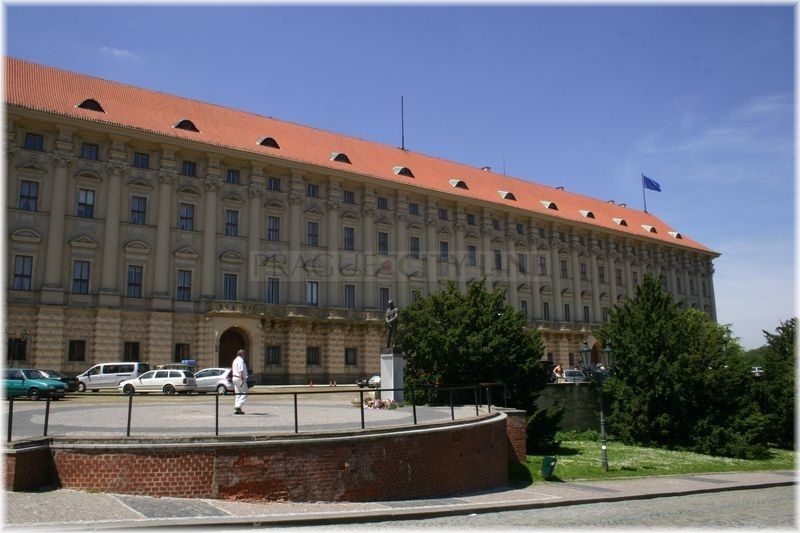 Another view point is the building of the Hradčany barracks from 1898. The former Strahovská brána (Strahov Gate) used to stand right in this place. Nearby you will spot Kučera´s Palace whose white Rococo facade cannot be overlooked by the eyes of the visitors. There are more interesting monuments here such as the house U Zlatého lva (At the Golden Lion) or the opposite house U Zlatého stromu (At the Golden Tree). 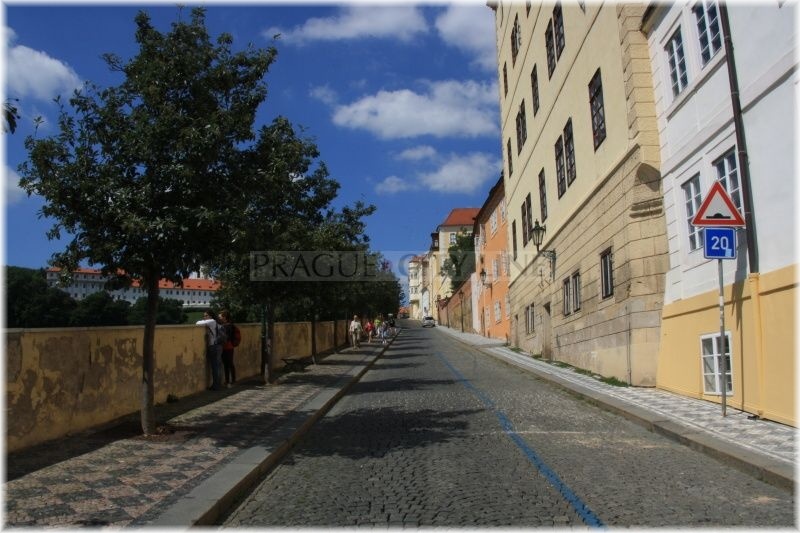 You will find a very narrow staircase here leading towards Strahovské nádvoří (Strahov Courtyard). Another spacious construction is also the house U Šliků, the former municipal court, school and a orphanage. Not far from Pohořelec another very significant monument of Hradčany is located. Strahovský klášter (Strahov Monastery) is the oldest premonstate monastery in the territory of Bohemia. The monastery was founded in 1140 by the Czech prince and future king Wladyslaw II. In 1143 the premonstate monks from the Westphalian Steinfeld arrived in the monastery. The monastery was in operation until 1950 when it was closed and the local friars were taken away from there. Strahov monastery has seventy-four friars these days. Some of them are active in the monastery, others all over republic. Yet the precious treasures are hidden behind the monastery walls. There is the very important capitular chamber which was restored into its original appearance in 1990. It is the place where the new friary members are admitted. Also very precious paintings and other artworks are placed in here. Furthermore, there is a significant picture gallery in the premises whose collections contain pictures from the Gothic period until romanticism and which is nowadays ranked among the most significant galleries of Bohemia. Another remarkable room is the monastery library, one of the most precious and most well-preserved historical libraries not just in our country. More than two hundred thousand books are saved here including more than three thousand manuscripts and even five thousand five hundred incunabula which are located in a special depositary. The library complex is composed of the Theological and Philosophical Halls. From Pohořelec the royal route will take us to Loretánské náměstí (Loretánské Square) which used to be located behind the gates of Hradčany in the past. Between 10th-12th centuries there was a burial ground in this area and a market place two centuries later. Then the bourgeois houses were built here that were a bit later replaced by the aristocratic palaces and other historical buildings. Černínský palác (Černín Palace) which takes a dominant position is currently one of the most remarkable Baroque palaces of the capital city. Its construction started in 1669, originally in Renaissance style. It was a common work of many significant sculptors, architects and stonemasons of that period. After the palace had been completed the precious Černín Picture gallery and other art collections of the dynasty were integrated into its walls. 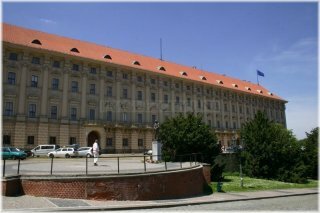 Černín Palace became the residence of the Ministry of Foreign Affairs in 1934. The Capuchin Monastery with the Church of Our Lady of the Angels and also Malý Černínský dům (Small Černín House) are ranked among remarkable buildings of Loretánské Square. 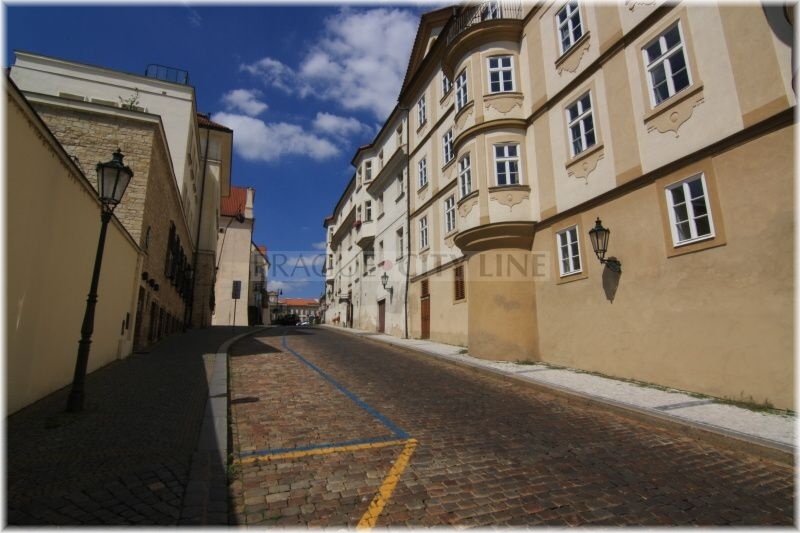 The Prague Loreta is a momentous construction and the square and the adjacent street carry its name. It was built according to Santa Casa of Nazareth, i.e. according to the dwelling of Virgin Mary. Loreta of Hradčany is one of the most familiar and most significant pilgrimage places of the republic. The construction of the oldest part of the building started in 1626 and the interior decoration contained symbolic biblical sceneries and fresco paintings. The main facade was performed by the renowned architect Dienzenhofer. Inside Loreta, visitors can view the statue of the merciful Loretan Virgin Mary in a silver frame. Another popular tourist target is the carillon inside the Loreta tower. The carillon originates in the workshop of a Prague watchmaker Neumann and was created in 1694. It is composed of twenty-seven bells that together create an exceptional experience. The royal procession further continued along Loretánská street. One of the unique constructions is to be found in this street – Hradčany Town Hall which was built in 1598. It was this building that was saved from all the fires and disasters due to which the other houses were destroyed. Therefore this house is the direct witness of the royal coronation processions. 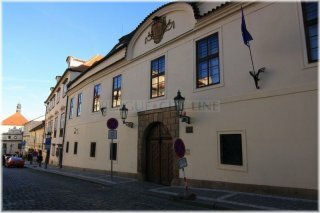 The gorgeous Renaissance facade of the house with sgraffito decorations and the Imperial Symbol and the symbol of Hradčany have survived. Another remarkable landmark is Hrzánský palác (Hrzán Palace). 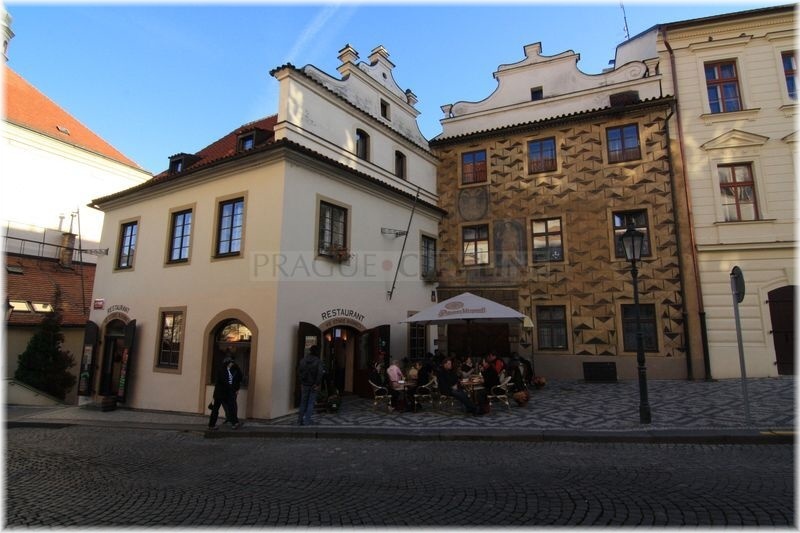 It is the former residence of the significant architect Petr Parléř who was in charge of the construction of St. Vitus Cathedral, Charles Bridge and stonemason decorations of the Old Town Astronomical Clock and of many other remarkable historical landmarks not only in Prague. The building was occupied by the Ministry of Culture of ČSSR and also by the Government of ČSSR after 1949. 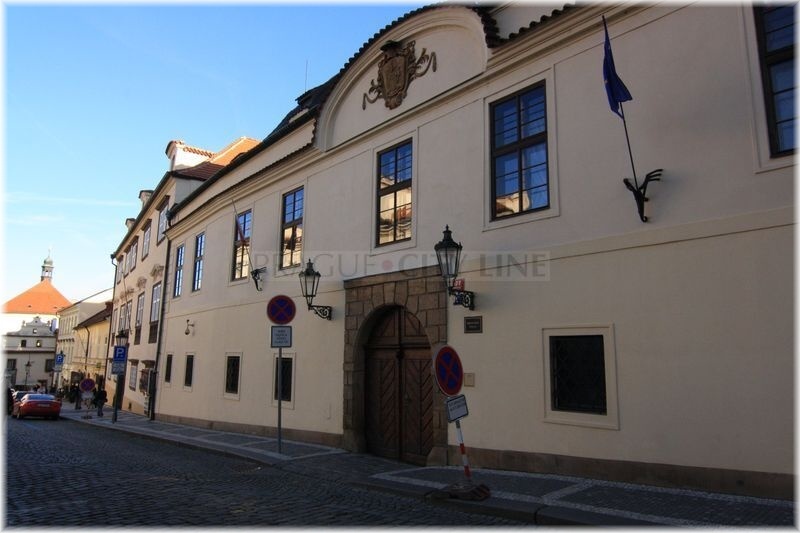 Currently it is used as representative premises of the presidium of the Government of the Czech Republic and of the prime minister of the Czech Republic who has his office in Hrzán House. Besides Dietrichštejnský palác we need to mention Martinický palác, too. 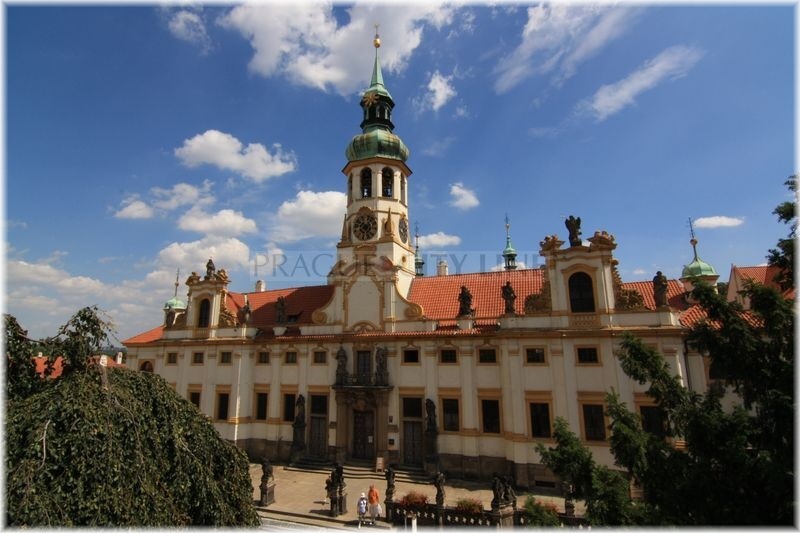 The Baroque palace was built in 1702 and it also went through many changes in its history. There used to be a military hospital and in 1960 the batallion of the Castle Guard moved into the palace, therefore it is used as barracks of the Castle Guard these days. From Nerudova street the royal coronation processions made for the final part of the way leading towards St. Vitus Cathedral. They continued through Úvoz, Pohořelec where they turned around in front of Strahov Monastery gates and passed along Loretánská street towards Hradčanské náměstí (Hradčasnké Square) and Prague Castle. Behind Hradčanské Square the processions crossed the bridge which protected the entrance into Prague Castle until mid-18th century.